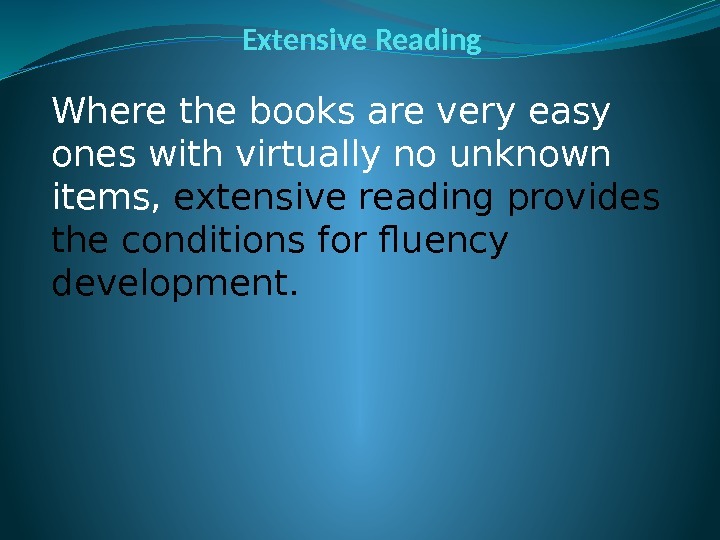 Extensive Reading Where the books are very easy ones with virtually no unknown items, extensive reading provides the conditions for fluency development. 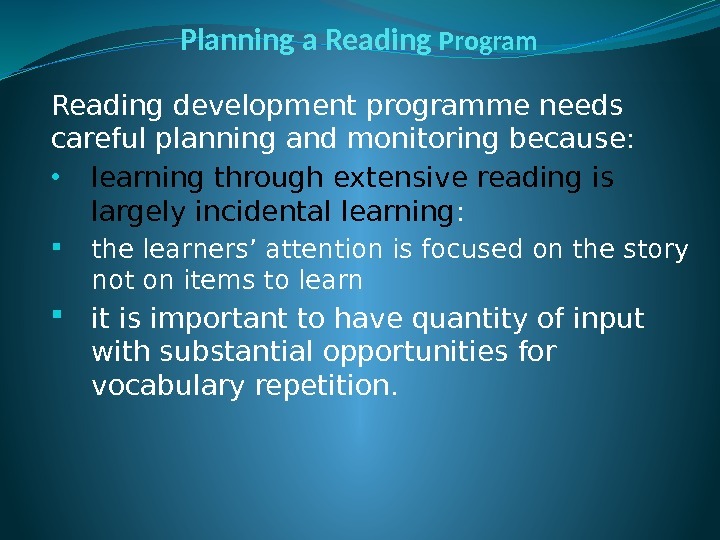 Planning a Reading Program Reading development programme needs careful planning and monitoring because: • learning through extensive reading is largely incidental learning : the learners’ attention is focused on the story not on items to learn it is important to have quantity of input with substantial opportunities for vocabulary repetition. 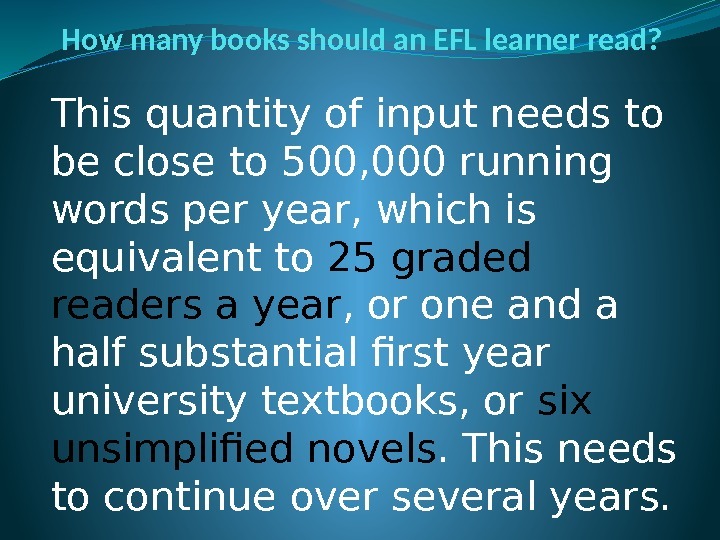 How many books should an EFL learner read? This quantity of input needs to be close to 500, 000 running words per year, which is equivalent to 25 graded readers a year , or one and a half substantial first year university textbooks, or six unsimplified novels. This needs to continue over several years. 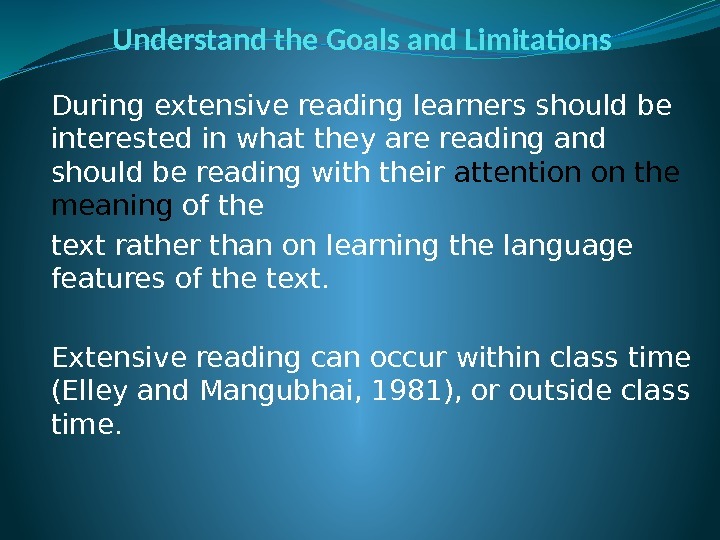 Understand the Goals and Limitations During extensive reading learners should be interested in what they are reading and should be reading with their attention on the meaning of the text rather than on learning the language features of the text. Extensive reading can occur within class time (Elley and Mangubhai, 1981), or outside class time. 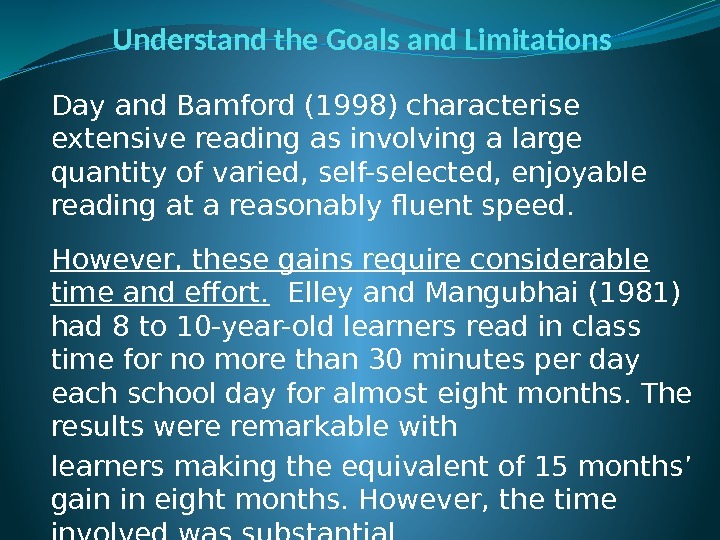 Understand the Goals and Limitations Day and Bamford (1998) characterise extensive reading as involving a large quantity of varied, self-selected, enjoyable reading at a reasonably fluent speed. However, these gains require considerable time and effort. Elley and Mangubhai (1981) had 8 to 10 -year-old learners read in class time for no more than 30 minutes per day each school day for almost eight months. The results were remarkable with learners making the equivalent of 15 months’ gain in eight months. However, the time involved was substantial. 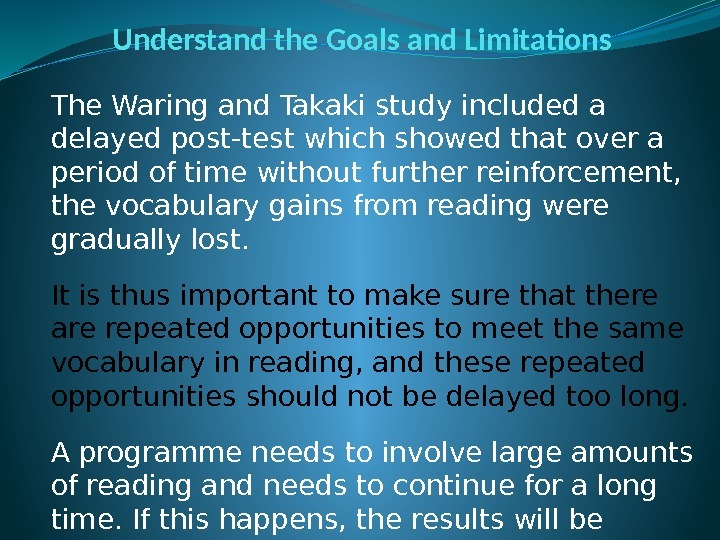 Understand the Goals and Limitations The Waring and Takaki study included a delayed post-test which showed that over a period of time without further reinforcement, the vocabulary gains from reading were gradually lost. It is thus important to make sure that there are repeated opportunities to meet the same vocabulary in reading, and these repeated opportunities should not be delayed too long. A programme needs to involve large amounts of reading and needs to continue for a long time. If this happens, the results will be impressive. 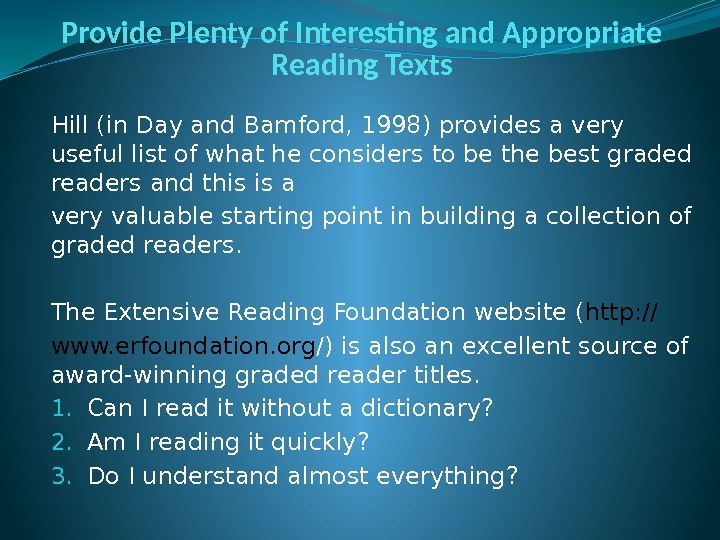 Provide Plenty of Interesting and Appropriate Reading Texts Hill (in Day and Bamford, 1998) provides a very useful list of what he considers to be the best graded readers and this is a very valuable starting point in building a collection of graded readers. 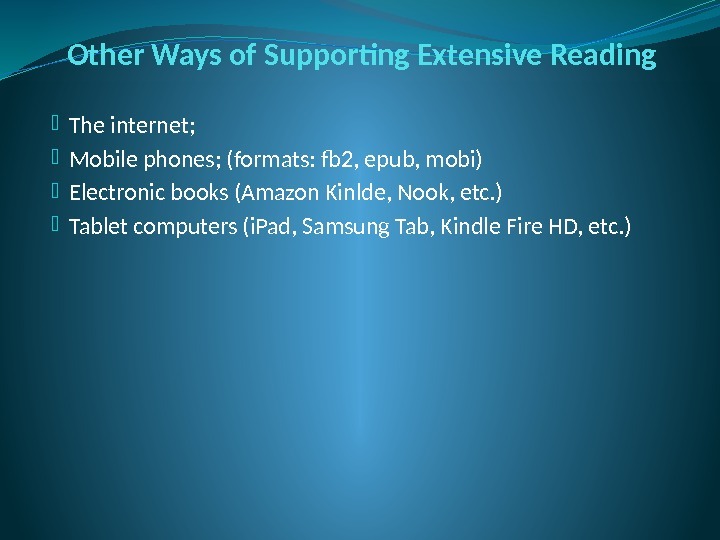 The Extensive Reading Foundation website ( http: // www. erfoundation. org /) is also an excellent source of award-winning graded reader titles. 1. Can I read it without a dictionary? 2. Am I reading it quickly? 3. Do I understand almost everything? 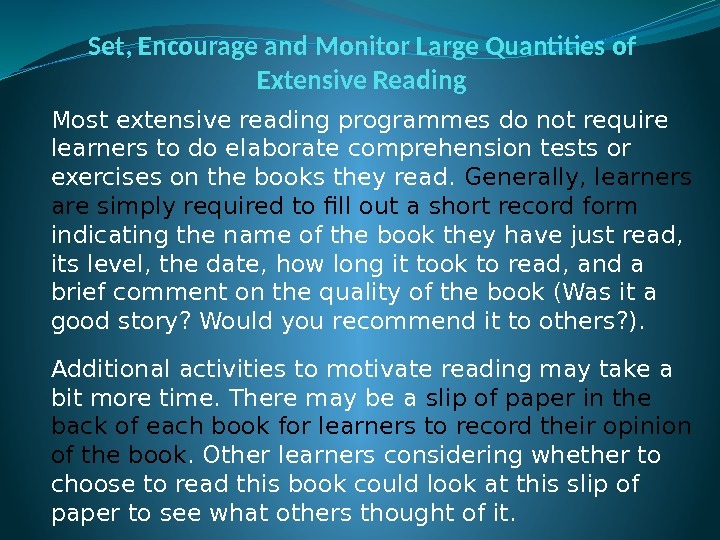 Set, Encourage and Monitor Large Quantities of Extensive Reading Most extensive reading programmes do not require learners to do elaborate comprehension tests or exercises on the books they read. Generally, learners are simply required to fill out a short record form indicating the name of the book they have just read, its level, the date, how long it took to read, and a brief comment on the quality of the book (Was it a good story? Would you recommend it to others? ). Additional activities to motivate reading may take a bit more time. There may be a slip of paper in the back of each book for learners to record their opinion of the book. Other learners considering whether to choose to read this book could look at this slip of paper to see what others thought of it. 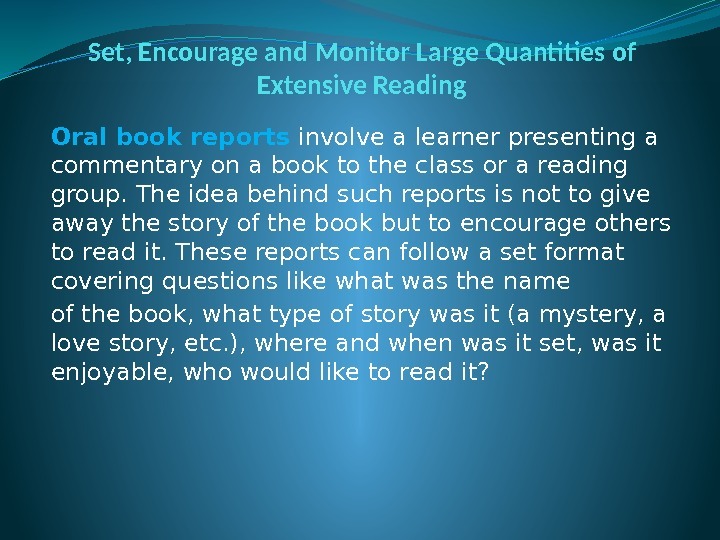 Set, Encourage and Monitor Large Quantities of Extensive Reading Oral book reports involve a learner presenting a commentary on a book to the class or a reading group. The idea behind such reports is not to give away the story of the book but to encourage others to read it. These reports can follow a set format covering questions like what was the name of the book, what type of story was it (a mystery, a love story, etc. ), where and when was it set, was it enjoyable, who would like to read it? 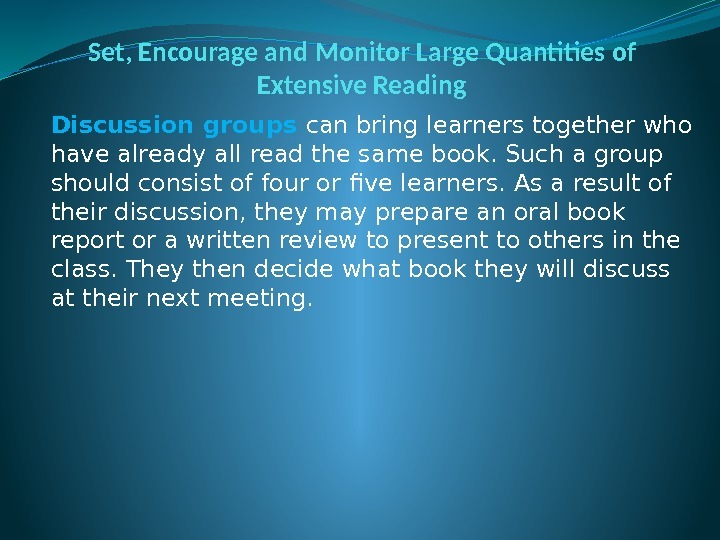 Set, Encourage and Monitor Large Quantities of Extensive Reading Discussion groups can bring learners together who have already all read the same book. Such a group should consist of four or five learners. As a result of their discussion, they may prepare an oral book report or a written review to present to others in the class. They then decide what book they will discuss at their next meeting. 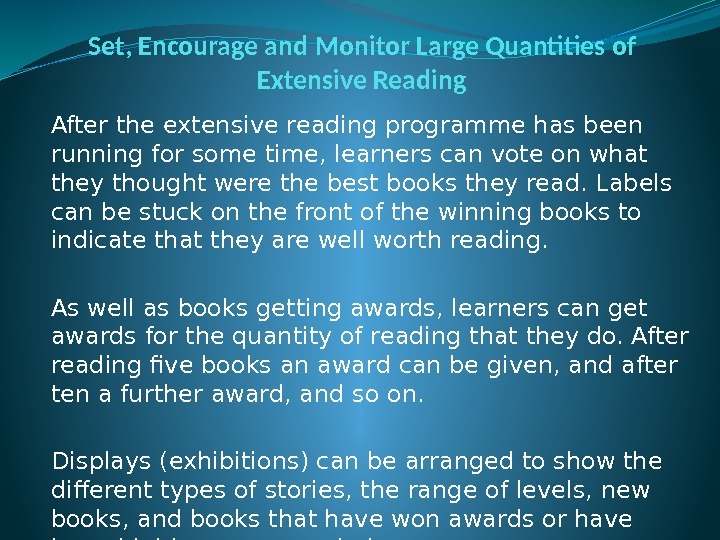 Set, Encourage and Monitor Large Quantities of Extensive Reading After the extensive reading programme has been running for some time, learners can vote on what they thought were the best books they read. Labels can be stuck on the front of the winning books to indicate that they are well worth reading. As well as books getting awards, learners can get awards for the quantity of reading that they do. After reading five books an award can be given, and after ten a further award, and so on. Displays (exhibitions) can be arranged to show the different types of stories, the range of levels, new books, and books that have won awards or have been highly recommended. 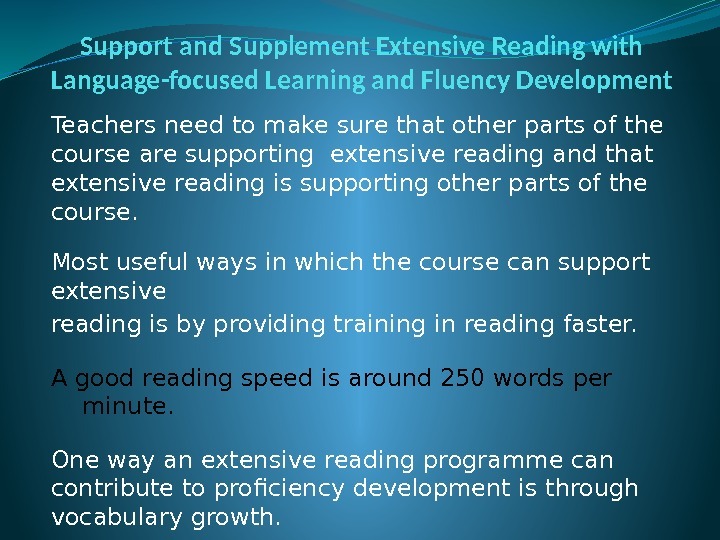 Support and Supplement Extensive Reading with Language-focused Learning and Fluency Development Teachers need to make sure that other parts of the course are supporting extensive reading and that extensive reading is supporting other parts of the course. 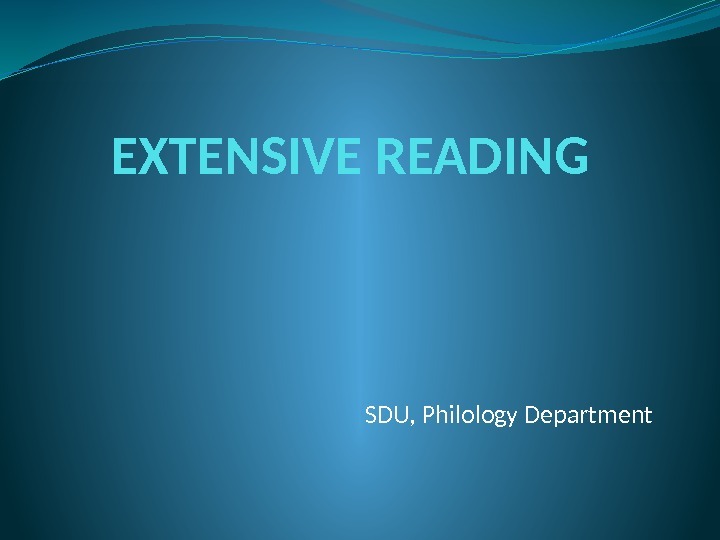 Most useful ways in which the course can support extensive reading is by providing training in reading faster. A good reading speed is around 250 words per minute. 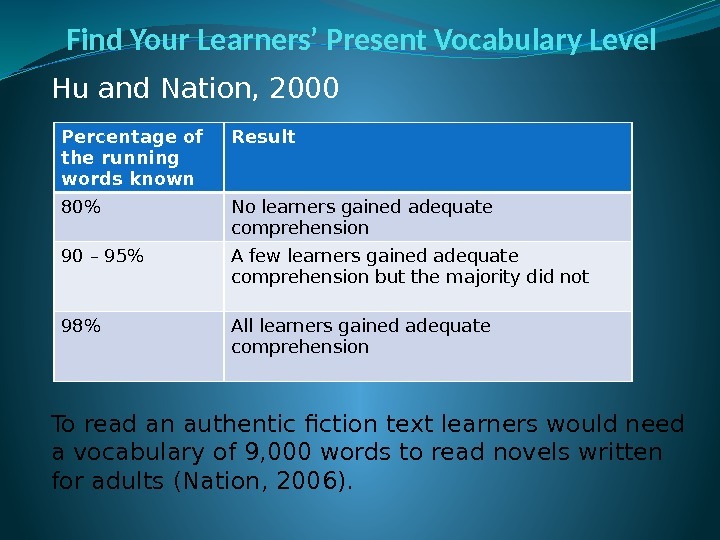 One way an extensive reading programme can contribute to proficiency development is through vocabulary growth. 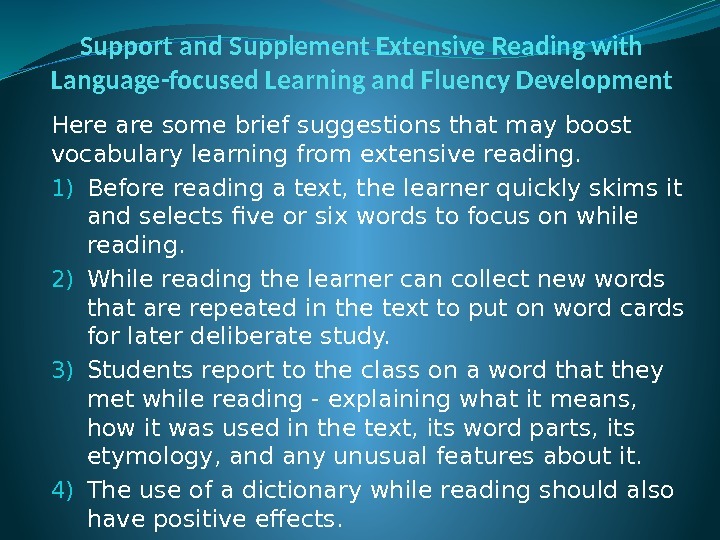 Support and Supplement Extensive Reading with Language-focused Learning and Fluency Development Here are some brief suggestions that may boost vocabulary learning from extensive reading. 1) Before reading a text, the learner quickly skims it and selects five or six words to focus on while reading. 2) While reading the learner can collect new words that are repeated in the text to put on word cards for later deliberate study. 3) Students report to the class on a word that they met while reading — explaining what it means, how it was used in the text, its word parts, its etymology, and any unusual features about it. 4) The use of a dictionary while reading should also have positive effects. 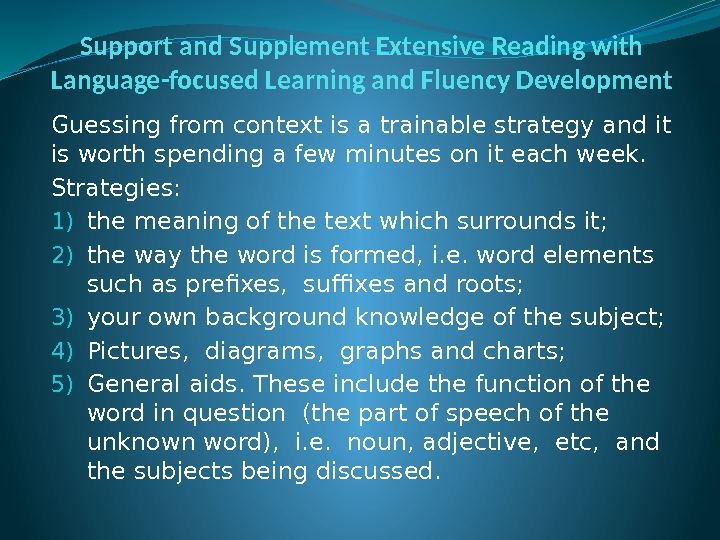 Support and Supplement Extensive Reading with Language-focused Learning and Fluency Development Guessing from context is a trainable strategy and it is worth spending a few minutes on it each week. Strategies: 1) the meaning of the text which surrounds it; 2) the way the word is formed, i. e. word elements such as prefixes, suffixes and roots; 3) your own background knowledge of the subject; 4) Pictures, diagrams, graphs and charts; 5) General aids. These include the function of the word in question (the part of speech of the unknown word), i. e. noun, adjective, etc, and the subjects being discussed. 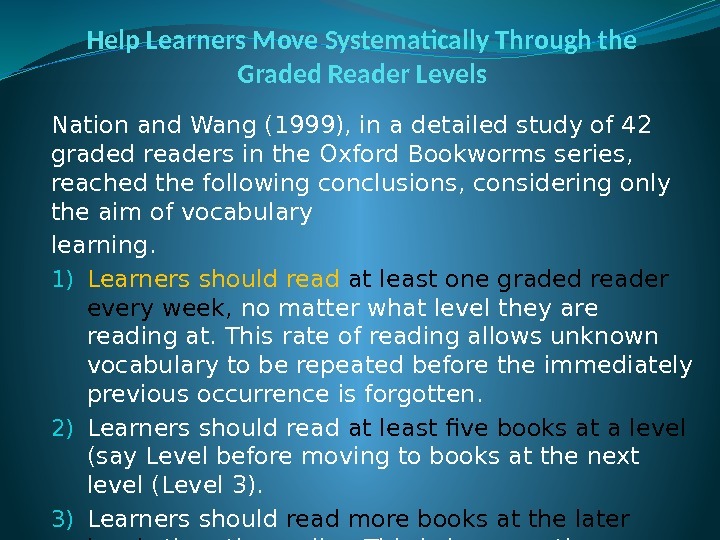 Help Learners Move Systematically Through the Graded Reader Levels Nation and Wang (1999), in a detailed study of 42 graded readers in the Oxford Bookworms series, reached the following conclusions, considering only the aim of vocabulary learning. 1) Learners should read at least one graded reader every week, no matter what level they are reading at. This rate of reading allows unknown vocabulary to be repeated before the immediately previous occurrence is forgotten. 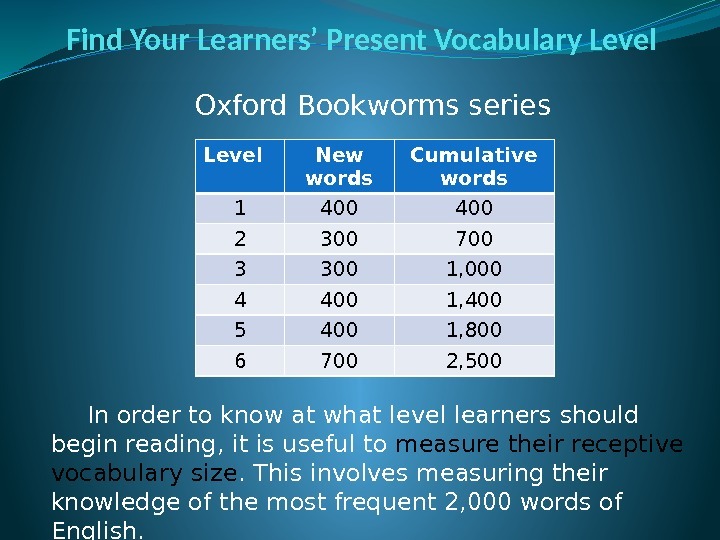 2) Learners should read at least five books at a level (say Level before moving to books at the next level (Level 3). 3) Learners should read more books at the later levels than the earlier. This is because the vocabulary of the earlier levels occurs very frequently in the books at the later levels. Help Learners Move Systematically Through the Graded Reader Levels 4) Learners should read at least 15– 20 and preferably 30 readers in a year. This number of graded readers provides plenty of repetition for the vocabulary and provides the opportunity to meet most of the vocabulary several times. 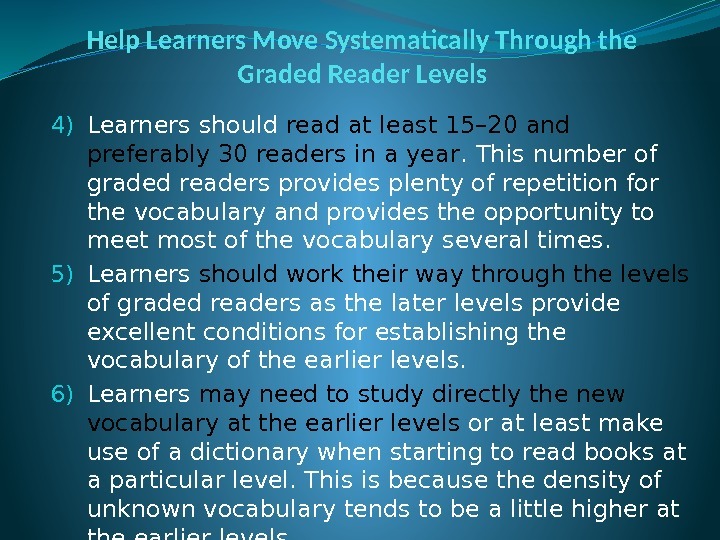 5) Learners should work their way through the levels of graded readers as the later levels provide excellent conditions for establishing the vocabulary of the earlier levels. 6) Learners may need to study directly the new vocabulary at the earlier levels or at least make use of a dictionary when starting to read books at a particular level. This is because the density of unknown vocabulary tends to be a little higher at the earlier levels. 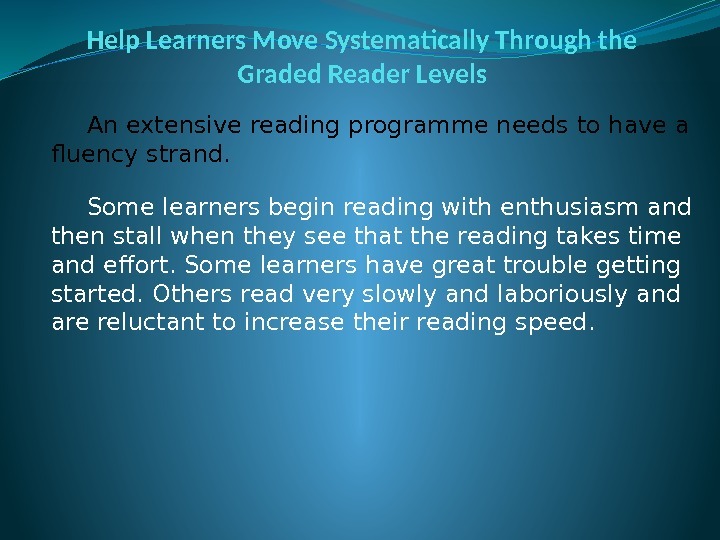 Help Learners Move Systematically Through the Graded Reader Levels An extensive reading programme needs to have a fluency strand. Some learners begin reading with enthusiasm and then stall when they see that the reading takes time and effort. Some learners have great trouble getting started. 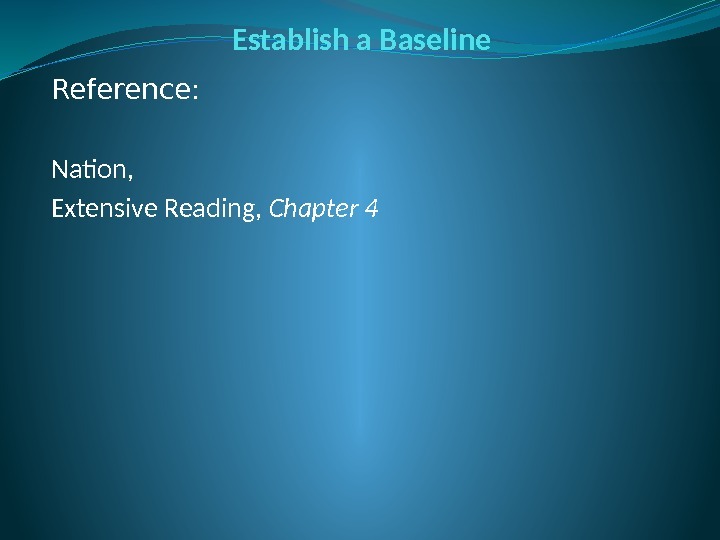 Others read very slowly and laboriously and are reluctant to increase their reading speed. Simplified and Unsimplified Texts For some teachers and researchers, graded readers are seen as being inauthentic, watered-down versions of richer original texts. Vocabulary simplification is also seen to result in more complicated grammar as what could be neatly expressed in one word is now expressed in several simpler words. 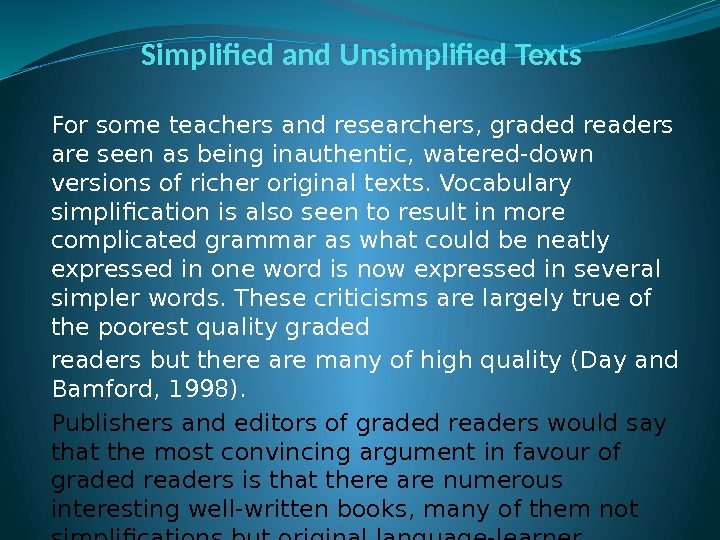 These criticisms are largely true of the poorest quality graded readers but there are many of high quality (Day and Bamford, 1998). Publishers and editors of graded readers would say that the most convincing argument in favour of graded readers is that there are numerous interesting well-written books, many of them not simplifications but original language-learner literature. This is undoubtedly true. 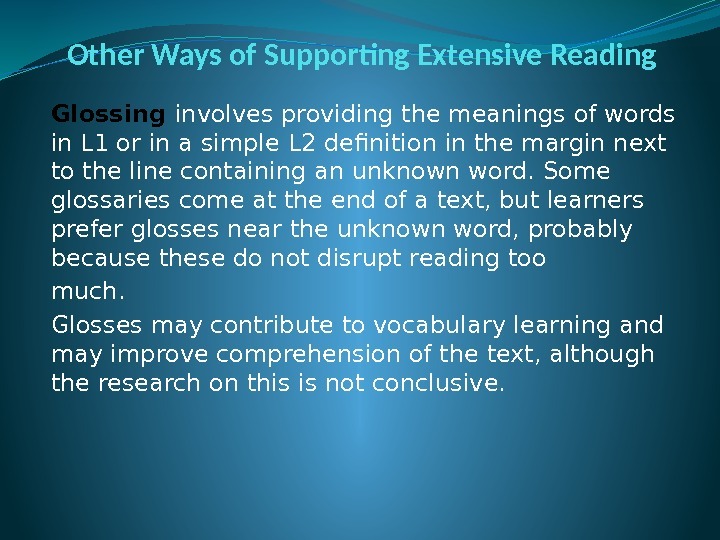 Other Ways of Supporting Extensive Reading Glossing involves providing the meanings of words in L 1 or in a simple L 2 definition in the margin next to the line containing an unknown word. Some glossaries come at the end of a text, but learners prefer glosses near the unknown word, probably because these do not disrupt reading too much. Glosses may contribute to vocabulary learning and may improve comprehension of the text, although the research on this is not conclusive. 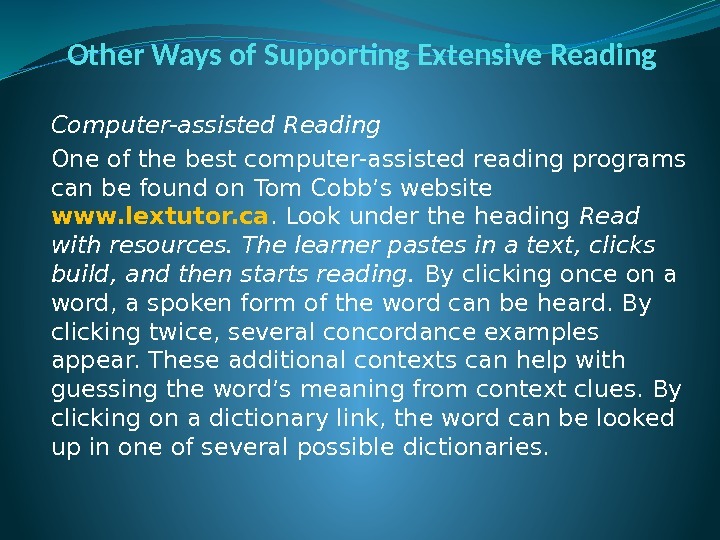 Other Ways of Supporting Extensive Reading Computer-assisted Reading One of the best computer-assisted reading programs can be found on Tom Cobb’s website www. lextutor. ca. Look under the heading Read with resources. The learner pastes in a text, clicks build, and then starts reading. By clicking once on a word, a spoken form of the word can be heard. By clicking twice, several concordance examples appear. These additional contexts can help with guessing the word’s meaning from context clues. By clicking on a dictionary link, the word can be looked up in one of several possible dictionaries. 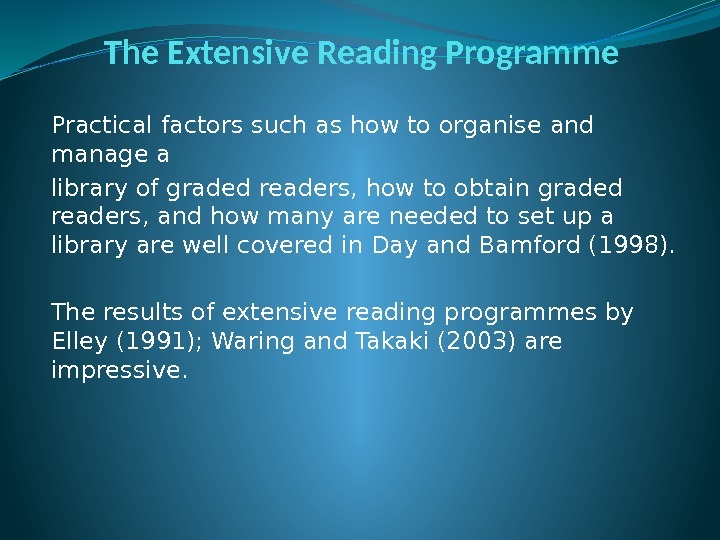 The Extensive Reading Programme Practical factors such as how to organise and manage a library of graded readers, how to obtain graded readers, and how many are needed to set up a library are well covered in Day and Bamford (1998). The results of extensive reading programmes by Elley (1991); Waring and Takaki (2003) are impressive.